It was Halloween and the sky looked like a creature. Exactly which creature, the astrophotographer was unsure but (possibly you can suggest one). Exactly what caused this eerie apparition in 2013 was sure: one of the best auroral displays in recent years. This spectacular aurora had an unusually high degree of detail. Pictured here, the vivid green and purple auroral colors are caused by high atmospheric oxygen and nitrogen reacting to a burst of incoming electrons. Birch trees in Tromsø, Norway formed an also eerie foreground. 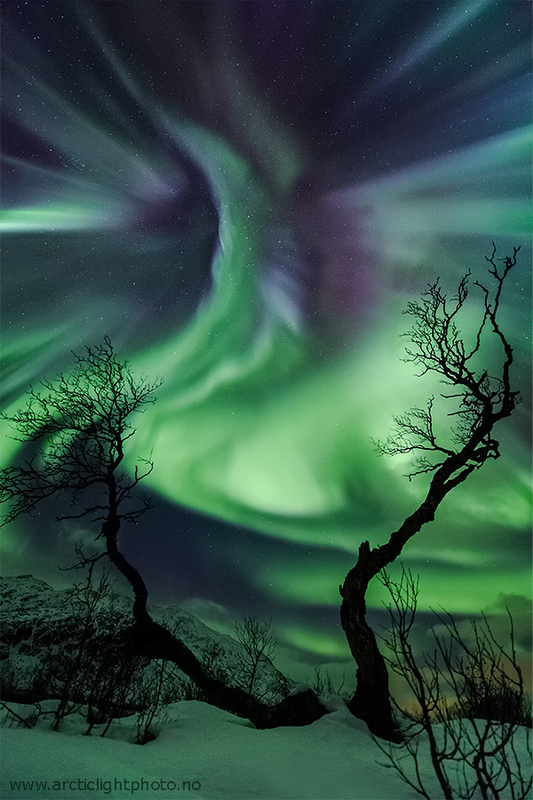 Recently, new photogenic auroras have accompanied new geomagnetic storms.